When you click on a link shared in your friends’ news feed, images etc. You allow untrusted Facebook apps to access your account information. Before you learn the ways to protect your Facebook account against any malicious links, you need to have the knowledge to discern between a malicious link and a safe link. How to know if a link contains virus? Stalker links: when a link tells you to show who on Facebook were searching for your profile-this sort of links definitely has evil intention because only Facebook can offer you this service, not anyone else. A link claiming to have a video of you or with an unbelievable video title. When any new world event breakout such as any accident, attacks or anything, you may expect to see links surfacing in Facebook claiming to show you live streaming of that event. Avoid those types of links. A Facebook message claiming that it can show you who has tagged you and commented on your photos and shares. 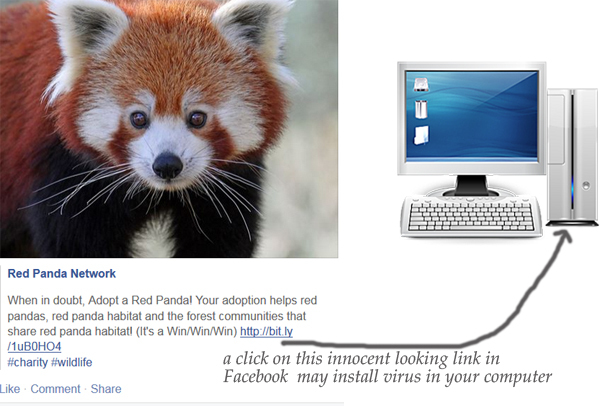 A link containing virus may show you one of your friends as a commenter or tagger of your photos. Pay attention to what your friends are sharing on regular basis. If you see that they are sharing something that they have never shared before or something that you do not expect them to share with you, you better avoid to click on those shares. If a shared link seems to be coming from your friends or from a trusted website, then just hover your mouse over that link and see the source of that link in the left-bottom side of your browser window. Pay attention to the shared contents of your friends and avoid accepting friendship requests from unknown people. Cleanup your browsers privacy data. Install CClener (free version) and clean all the temp files and unknown cookies etc. Logout your Facebook account when you do not use it. Keep your Facebook account safe and clean because social media has the ability to collect your sensitive information that may pose threat to your personal life. Remember that if your account gets infected with virus, your friends’ accounts can also get infected because the virus may send links to your friends from your account without your permission.